Free download Bvckup 2 latest version 78.16 It is a shareware application software and used to backup your data. The developers of the program say that select a pair of folders and Bvckup 2 will make sure that one stays an exact copy of the other. It is light, uncomplicated and really well designed. It is also incredibly fast. The app is very fast at bulk copying and it is even faster at updating. 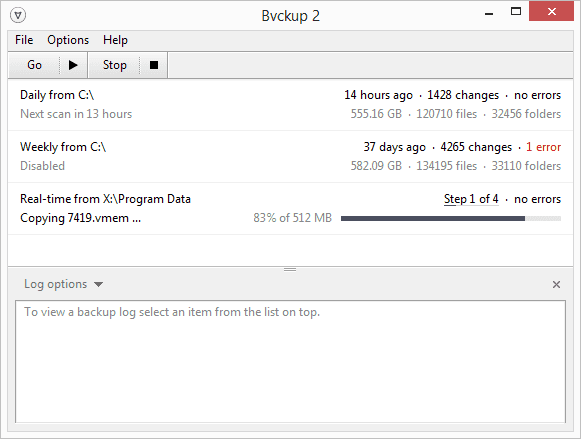 Extensively optimized across the board Bvckup 2 goes out of its way to process every backup as quickly as possible. The app does not compress, encrypt or FTP files. It’s not a two-way sync nor does it come with a restore function. It does just one thing – it mirrors A to B.
It’s better to excel at one thing than to be average in many. From the nuanced user interface to the high-performance core, the app is built to always favor quality over quantity. Its real-time backups continuously monitor for changes and back them up as soon as they happen. Run backups at fixed time intervals or only when started manually. around by copying modified parts of files only. This speeds things up, in many cases dramatically. Detect files and folders being moved at source and replicate this as a single quick operation on the backup side. Avoid re-scanning backup location on every run by scanning it once and saving its file index locally and much more.